The Artful Wall is our, Elaine Wu and my, response to the second assignment for FA350. The assignment was to go out into the UVic campus and find a location to build a wall. Design the wall and create a presentation to pitch your idea to the UVic board of directors. Attached is a movie of the presentation Elaine and I created for class… I have voiced over the presentation with a close facsimile of what Elaine and I delivered to the rest of the FA350 class. First let me say I loved FA350: An Introduction to Architecture: Theory & Practice at UVic. I took it this July (2011) in condensed format… Monday to Friday, 4:30-6:30, for 3 weeks + 2 days… it was awesome! The first assignment? 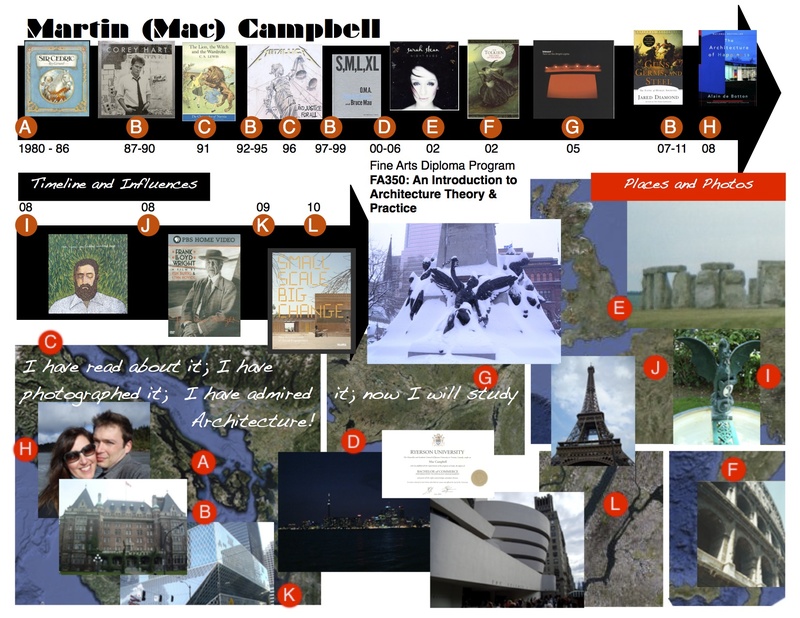 On a 8.5 * 11 piece of paper design a graphic to represent and introduce yourself to your classmates, and explain why you are interested in Architecture. Being process minded and cognisant that personality is at least partially an emergent characteristic I designed this.